This poor old window landed in my workshop just after Christmas, it is over a meter long, but not that wide and is the dinning room door to a house in Chagford. I dont think the panel is as old as the Art Noveau design suggests, as the glass is quite thick modern machine rolled glass. However, it has badly buckled and as a result some of the glass has cracked and fallen out! The damage to the window is partly because it is in a high traffic area of the house, but mostly because it has been made without internal reinforcement, this is where thin steel rods are hidden inside the lead work and help keep windows straight and strong. These are used because large windows are heavy and lead is very soft and bendy, so over time if not properly reinforced the panel will bow and sag……needless to say I will be adding them when I put the window back together! Taking a window apart is a dangerous activity, old windows used all sorts of nasty compounds and chemicals in the cement and lead starts degrading after 93 years, so it is important that you damp down the lead to stop dust and wear a protective mask to prevent breathing it in. Before I dismantled the window I took a rubbing of it to use as a template and I managed to take this window apart without breaking any of the intact glass and as you can see I have numbered each piece so I know where they all go. 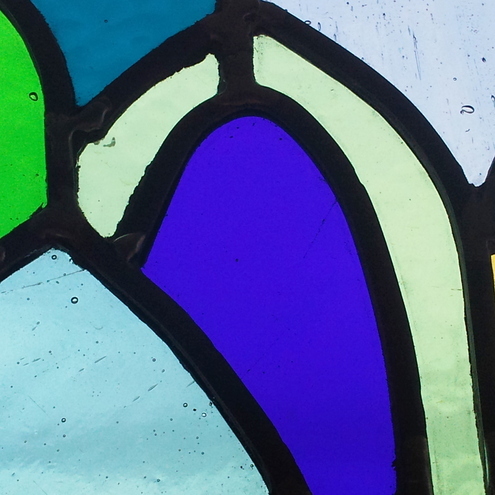 Now I am just trying to match the blue glass in the border of the window, so I am waiting for a delivery of glass. 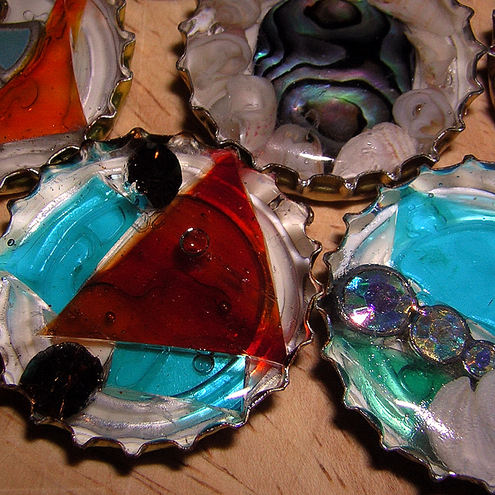 All the old lead gets recycled, the larger pieces of broken glass get reused in my recycled suncatchers and the small bits of glass I use for mosaics and appliqué glass sculptures, nothing is wasted! Whilst I wait for the right shade of blue I have a mermaid window to start and the drawings for a very large seascape to scale up, so I wont be bored! 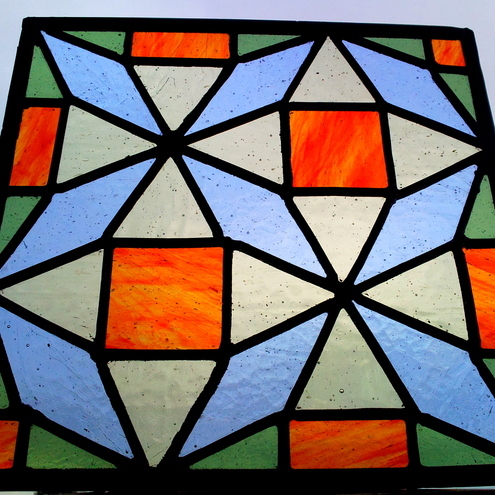 These panels were completed just before Christmas for a house in the centre of Exeter, in the very old part of the city, which is being totally renovated. They will run the full length of the wall, one above the other, from floor to ceiling as a feature between the kitchen area and sitting area of an open plan living space. The panel with 2 flowers will be at the top and they will follow horizontally from there. 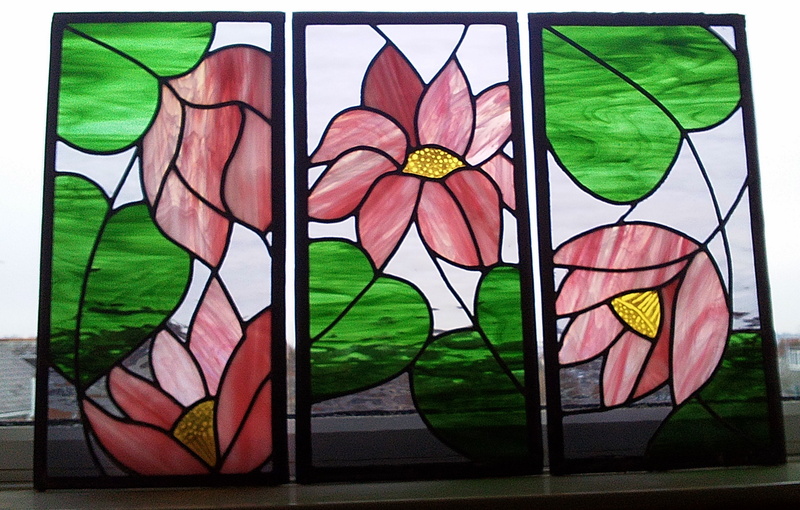 The design brief was to create lotus flower panels to fit with the colour scheme of the new kitchen and I have used light grey and green on green Spectrum water glass for the leaves and water, Spectrum wispy pink and white glass for the flowers and I have acid etched yellow cathedral glass for the centre of the flowers. The design flows from top to bottom and I was inspired by designs in an Art Nouveau pattern book. 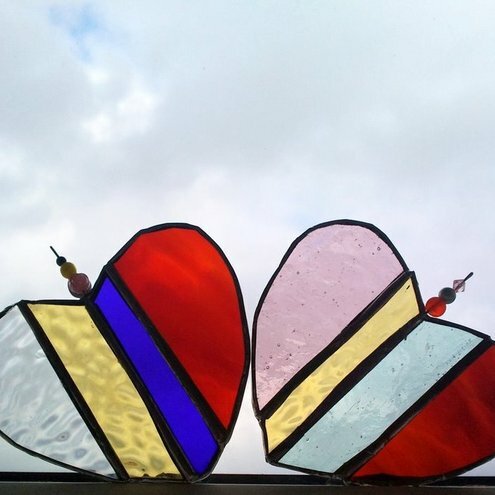 I have ensured all of the water glass pattern runs horizontally to mimic the ripples of water and the light transparency of this contrasts wonderfully with the semi translucent qualities of the pink glass, really making the flowers stand out from the panels. With all the terrible weather we have been having the building work has been slowed down, so they have not been fitted yet and I will add photos of them in place in due course, until then I am keeping them safe away from the building work! The slide show below shows the process from drawings to finished panel.